If you’re a whisky fan you’ll have no doubt enjoyed a Burns Night Supper or two, held every 25 January in celebration of Scotland’s national bard, but have you ever wondered where the evening’s many quirks and traditions come from? Matt Evans has the answers. ‘O Whisky! soul o’ plays and pranks! It’s clear from the poem Scotch Drink that Robert Burns was partial to a tot of the water of life. Small wonder the drink runs so freely during modern Burns Supper events; when it came to revelry, Rabbie’s lack of temperance was truly legendary. But even a seasoned whisky drinker might find Burns Night festivities difficult, and not due to the quantities of booze. Addressing the Haggis? Selkirk’s Grace? Strangers to Burns’ writing might balk at all the little customs, and those who have attended a traditional supper may be mystified as to their origins. Fortunately, here’s a handy history of Burns Night in time for 2018’s festivities to make sure newbies are going in prepped and ready, while dedicated Burns Supper attendees should come away with a few historical anecdotes. Slàinte! After Robert Burns died of ill health in 1796, a group of nine friends and patrons got together to celebrate his life on his birthday in 1801. The event was held in Burns’ family home, Burns Cottage in Alloway, and even two centuries ago the Supper’s familiar checklist was already taking shape. ‘The organiser, Rev’d Hamilton Paul, kept notes of the occasion and it is surprisingly similar to what we do today,’ says Dr Clark McGinn, writer of The Ultimate Burns Supper Book, ‘with a haggis being “addressed” and eaten, a toast to Burns' memory and a number of Burns’ own poems and songs.’ Aside from the group serving toasted sheep’s head with the haggis, the celebration was already recognisable as Burns Night in its current form. The tradition of honouring Burns didn’t stay in Scotland for long. As Scots travelled the world as part of the British Empire, they brought their idiosyncrasies with them. Gradually the event became a celebration of the trappings of Scottish culture, namely a role in the ceremony for the bagpipes, kilted dress and of course, plenty of whisky. From his ode to the distillation process in John Barleycorn to his rage against taxation in The Author’s Earnest Cry and Prayer, an amber vein runs through Burns’ work, tracing a love of whisky throughout his life. Although Burns’ predilection to excess is not quite an example to be followed, to pour a dram for the traditional toasts is part and parcel of the Burns experience. 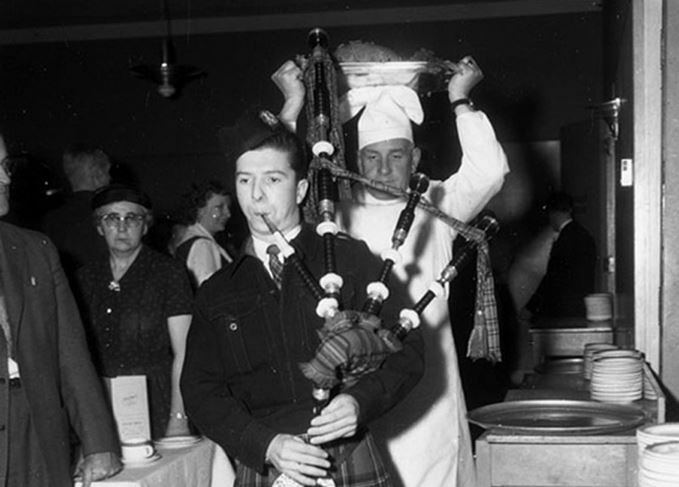 Any big-budget Burns Night will have the guests walk into the dining room accompanied by bagpipes. As Scottish as it gets, the bagpipes are a mark of significance, appearing at weddings, funerals and Burns. In 1786, Burns penned one of his best-known works, Address to a Haggis. Reflecting his love of the dish, the haggis is given a position of honour as the main course, being piped in on a silver platter before the host recites the poem, with as much gusto as possible, directly to the pudding. As the Address is a somewhat lengthy affair, today many hosts choose to omit several verses out of pity for their now likely well-inebriated guests. After, the haggis is toasted, as all the guests raise their drams and cry ‘the haggis!’ before tucking in. The main speaker is introduced and gives a speech championing Burns’ legacy. Full of wit and praise for not just Burns’ work but his life and country as a whole, the speech ends with a toast to the bard’s immortal memory. ‘It would have been mainly men taking part in Burns night, as a very exclusive affair,’ says McCheyne. ‘The Toast to the Lassies only came about in the last 70-80 years. Given that Burns Suppers have been going on for over 200 years, that’s fairly recently!’ Traditionally, the host made a short speech thanking the women for cooking the meal, but this is no longer the sole purpose of the Toast. It’s now a (hopefully) humorous meditation on gender, after which the women get to reply in kind with a separate toast, the ‘Reply to the Laddies’. After the ‘Vote of Thanks’ by the host, making his or her appreciation known to the guests, everyone will traditionally join hands and sing Burns’ most famous work. But why? ‘It may simply be its place at the end of events as the song of parting, or reminiscence,’ says Kirsteen McCue, Professor of Scottish Literature and Song Culture at Glasgow University, home to the Centre for Robert Burns Studies. ‘The whole song is a nostalgic view of the importance of friendship across the years. It was regularly sung as a “parting song” at social events in Burns’s own day.’ It’s important to know Burns’ version of this song is one of several; it’s a folk song simply recorded, tweaked and published by Burns, not originally penned by him directly.